Unique, centrally managed VPN Client Suite for Windows, Android, OS X, Linux and Windows CE/Mobile, compatible with all common gateways. Enterprise IT departments are tasked with managing several hundreds or thousands of users and must have full control over all end devices in a remote access environment at all times. To address this requirement a remote access infrastructure that supports centrally managed VPN clients, enables users to easily operate them and provides secure end-to-site communication is a must. 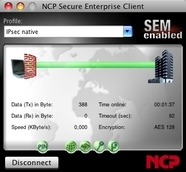 The NCP Secure Enterprise Client specifically addresses these requirements and is perfectly suited for large remote access VPN projects. Here you can find the most important product features. This VPN Client Suite is available for Windows 10, Windows 8.x, Windows 7 und Windows Vista. The highly secure communication software is designed for use in any remote access VPN environment. 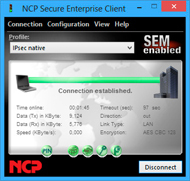 The NCP Secure Enterprise Mac Client is available for OS X 10.11 El Capitan, OS X 10.10 Yosemite, OS X 10.9 Mavericks and OS X 10.8 Mountain Lion. The highly secure communication software is designed for use in any remote access VPN environment. This VPN Client Suite is available for Ubuntu 12.04 LTS, SUSE Linux Enterprise Desktop 11 SP 3, CentOS 6.5, Open Suse 13.1, Fedora 20 and Debian 7.4. The highly secure communication software is designed for use in any remote access VPN environment. 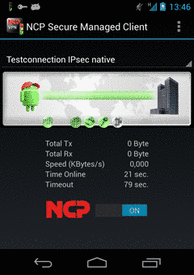 Use NCP's central VPN management solution to seamlessly integrate your Android end devices in your company-wide remote access VPN infrastructure. 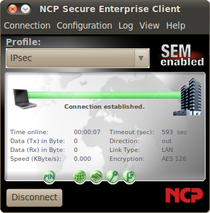 Universal, centrally managed IPsec client software for Windows CE 5.0 and Windows Mobile 6.x (other versions upon request). The highly secure communication software is designed for use in any remote access VPN environment. Download the Remote Access VPN Brochure (PDF).